Above is a video that I hope serves as the candied sweetness that draws you into reading the rest of this post. It’s a TED talk from British-born, Los Angeles-based educational theorist Ken Robinson. It’s brilliant and funny and the version I’m embedding has been viewed over two million times, so I think it’s safe to say that people like it. Sometimes these qualities are called for. And I am fascinated by the distractions which Art can offer, in the way that anyone would be fascinated by a car crash at the side of the road. But increasingly I care more about making Art as a process, about the way it engages people free of its role as entertainment. For those entirely deprived of web video, it’s a 60 Minutes segment about El Sistema, Venezuela’s much vaunted music education program for the public schools. There’s something lacking in this mini-documentary. 60 Minutes‘s storytelling style is a bit pat, almost too effective. It greases over the bumps, or the notion of what a program like El Sistema may be competing against for funding. For that let’s turn to this passage from a 2009 blog entry by David Byrne, wherein he recounts an awkward conversation he had with Portugal’s senator for culture. I suggested that it was more important that children, and everyone really, be imbued with a sense that they themselves might make things — that the things they might make have value — as opposed to learning mainly to appreciate the great masters, whether they be Bach, Picasso or the literary canon. I proposed that the value of art might be of more use to society in that regard, rather than focusing on supporting, well, museums and symphony halls. Naturally, to a senator who has made it her noble mission to argue for more support for the arts, this is slightly heretical and, as she said, “very American.” America’s lack of state support for the arts and skepticism of the value of fine art is legendary. I qualified my opinion by saying that I myself love a lot of “refined” contemporary art, and some highbrow or academic music as well — but I don’t assume that everyone should. Those who enjoy that stuff are not all wealthy, but they do constitute an elite, rarified world. By this definition, comic book fans and heavy metal fans are elite bunches as well. Every subculture is, in a way. I don’t presume that my tastes or those of my friends require lots of state support — although a little more in the US would be nice — and I would argue that supporting the arts and culture in schools at all levels is worth a lot more to our future quality of life. Encouraging students to write, to make stuff, to cook, design, to draw, play an instrument, record music, sing, edit films, etc. — all of that creates a sense of self-worth, curiosity and experimentation that has applications way beyond each of those disciplines. I would argue that this is where the greater percentage of state funding should go. Of course in the US, it’s the part that has been eliminated almost completely. Going deeper, even that quote fails to get across what art’s lasting effects on a child can be, though it’s more effective than the 60 Minutes style visual is. Watching children playing in unison, though powerful, is only the half of it. It displays the external view of arts education — children on display! — but it does not x-ray the internal view. Rather the goal for most of these kids was to, over the course of a semester, learn to make eye-contact, to connect to another human, to use art to not only slow themselves down but, more interestingly, to slow down the teachers instructing them. It’s easy to forget that children are not workers. They need to learn and absorb and develop at their own pace. I spent a solid portion of my hour or two in the class holding back tears. So let me end this post by returning to culture. 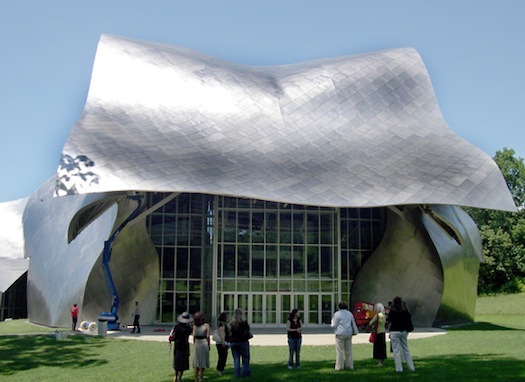 About one month back, driving around upstate New York, I ended up spending a few hours one afternoon on the campus of Bard College where I saw yet another temple to the Arts, Frank Gehry’s imposing Richard B. Fisher Center for the Performing Arts. It was a bit magical running into this temple in the middle of nowhere. But it didn’t quite match the magic of those kids in a classroom. And I had to wonder why I tend to find myself more in temples of culture than in classrooms of wonder. And while I don’t think one needs to choose one or the other in an absolute sense, I do think it’s worth realizing that spending more time with one than the other does represent a choice. And now, for a relieving rimshot to break up the mood. PS – As an aside that brings us back to where we started, there was a recent complication with the idea of bringing El Sistema to the United States. If you watch the 60 Minutes piece to the end, you’ll hear an administrator for Venezuela’s El Sistema say the program could easily translate to the United States. But, in fact, after a high-profile kick-off that began with founder Jose Abreu winning the TED Prize (natch! ), El Sistema USA has had well-documented issues, including the loss of fiscal sponsor, the New England Conservatory. This NPR piece points to the simple issue of competition for resources — El Sistema offers for free to kids what NEC wants to charge for.